The development of combination vaccines for protection against multiple diseases began with the combination of individual diphtheria, tetanus, and pertussis (DTP) vaccines into a single product; this combined vaccine was first used to vaccinate infants and children in 1948. It has become the cornerstone of pediatric and adult immunization programs, and over the years we have seen the addition of other vaccines to the combination and the replacement of components to improve its reactogenicity profile. An important advancement was the replacement of whole-cell pertussis antigens (wP) with less reactogenic acellular antigens (aP) in the early 1990s. This paved the way for the combination of diphtheria, tetanus, and acellular pertussis antigens (DTaP) with other routine vaccines such as inactivated polio vaccine (IPV), Haemophilus influenzae vaccine (Hib), and hepatitis B vaccine (HepB). In this article, we will describe in detail the composition of DTaP-based vaccines and provide an overview of the different variations of this combination that are licensed and in use. Furthermore, we will extensively review the technical challenges that have been faced as additional vaccines have been added to these combinations and speculate on the future developments for this group of vaccines. Another significant combination vaccine that protects against more than one disease is the measles, mumps, and rubella vaccine (MMR). However, this vaccine will not be discussed extensively here as, unlike the DTaP combination, MMR has not been built upon with the inclusion of additional vaccines. For almost 40 years, the MMR vaccine has remained a trivalent vaccine that is given as a single product. The number of immunizations recommended for children in the first 2 years of life has dramatically increased over time. In the United States the recommended immunization schedules for 2010 indicate that in the first 2 years children are expected to receive vaccines against 14 diseases [Figure 1]. Even with the use of the available pentavalent combination vaccine DTaP-IPV/Hib we have calculated that this recommendation can be achieved through a minimum of 17 injections. In a single visit to the pediatrician, infants may need to receive as many as six injections to comply with these recommendations. With such a complex immunization schedule, it becomes increasingly more challenging to incorporate new vaccines into the schedule. Figure 1: Recommended immunization schedule for children aged 0 through 6 years. This schedule has been adapted from the recommended immunization schedule from the Centers for Disease Control and Prevention. Recommendations are for all children except certain high-risk age-groups. For more information please consult original source. DTaP vaccines from different manufactures are very similar in their composition, with the main differences being related to the number, amount, and detoxification method of the pertussis components. Furthermore, some combinations contain additional vaccines such as HepB, Hib, and IPV in addition to the DTaP base. 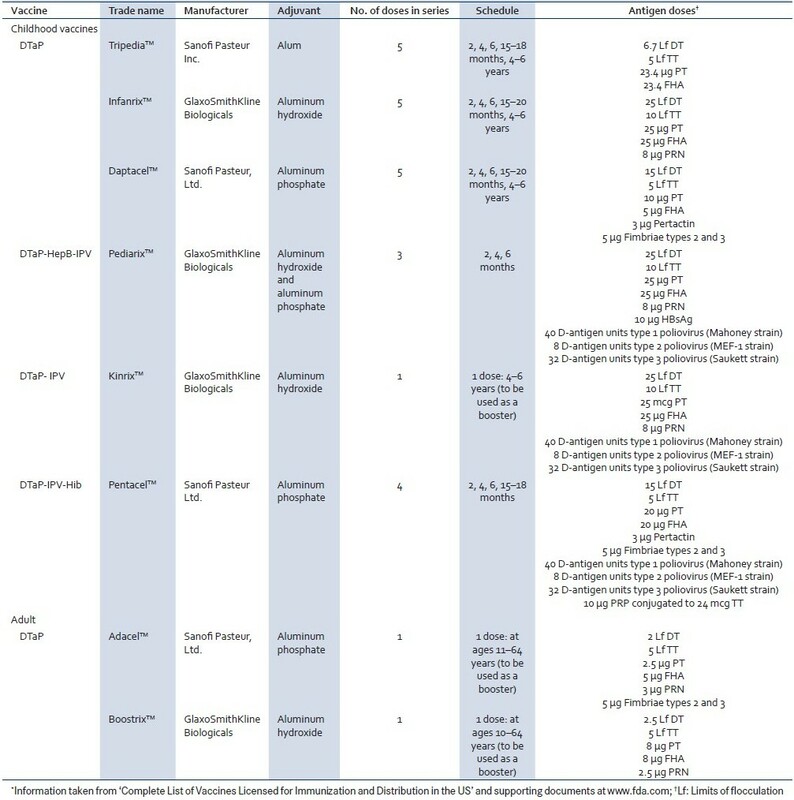 Here, we will use GlaxoSmithKline's (GSK) hexavalent vaccine Infanrix TM -hexa as a model to describe the different components of DTaP-based combination vaccines, as this represents the latest advance in licensed combination vaccine development [Table 2]. There is no other licensed combination vaccine on the market that protects against as many indications as Infanrix TM -hexa, which combines diphtheria, tetanus, acellular pertussis, hepatitis B, Haemophilus influenzae, and inactivated poliovirus vaccines (DTaP-HepB-Hib/IPV). Thus, this is composed of diphtheria, tetanus, and acellular pertussis antigens; hepatitis B surface antigen; inactivated poliovirus; and Haemophilus influenzae polyribosylribitol phosphate antigen conjugated to tetanus toxoid. Detailed descriptions of these antigens together with common abbreviations are summarized in [Table 2]. Infanrix TM -hexa is adjuvanted with both aluminum hydroxide and aluminum phosphate adjuvants, which is due to the combination of DTaP vaccine adsorbed onto aluminum hydroxide and HepB vaccine adsorbed onto aluminum phosphate. Although there are clear benefits with combination vaccines, the main challenge in their development is the risk that the efficacy or safety of the combination would be less than that seen with the administration of the vaccines separately. New combinations cannot be less immunogenic, less efficacious, or more reactogenic than the previously licensed uncombined vaccines. Immunological, physical, and/or chemical interactions between the combined components have the potential to alter the immune response to specific components. Furthermore, if the vaccines to be combined have differing immunization schedules, consolidation of these should also not negatively affect immunogenicity, efficacy, or safety. Finally, and ideally, the many advantages of combination vaccines should not be achieved at the cost of reduced product stability. From a practical standpoint, uncommon transport and storage conditions and complicated bedside mixing could hamper the development of a combination vaccine. In this section, we discuss in depth some of the key technical challenges that have faced the development and implementation of DTaP-based combination vaccines. With the use of specific examples, we highlight cases where putting together vaccines in DTaP-based combinations has affected the immunogenicity or safety of the final product. The most commonly reported example of immune interference in DTaP-based combination vaccines is the reduction in antibody titers to the Hib component of the vaccine polyribosylribitol phosphate antigen. ,, This has been reported for many DTaP-based vaccines, including the hexavalent vaccine DTaP-HBV-IPV/Hib., The interference has not been reported to the same extent for DTwP-based combination vaccines, mainly, it has been suggested, due to the adjuvant effect of the whole-cell pertussis (wP) component. ,, However, the adjuvant effect simply masks the underlying interference, and the mechanism by which the Hib response is reduced after combination with DTaP is complex and is still not completely understood. Consistent with clinical data, this reduction in Hib immunogenicity has also been demonstrated in preclinical animal models. Studies in a rat model looking at the interference of TT and different aP antigens with Hib reported reduced anti-PRP response with combined administration of Hib and TT, or Hib and FHA (a component of aP vaccine). The level of this reduction was reported to be comparable to that observed for combined administration of DTaP and Hib. The interference of TT with Hib is of particular interest, as TT is also present in the Hib vaccine as a carrier protein conjugated to the capsular polysaccharide PRP. Possible mechanisms for the effect of free unconjugated TT on the Hib PRP-TT conjugate includes competition between TT-specific and PRP-specific B cells for the Hib conjugate antigen, suppression of PRP response by clonal expansion of TT-specific B cells, and physical prevention of binding of the conjugate antigen to PRP-specific B cells by the TT carrier protein. The reduced anti-PRP response with FHA is in line with the finding that it is a potent suppressor of IL-12 and IFN-γ production in vivo and in vitro, suppressing immune responses to co-injected antigens., Another explanation for the reduced Hib response when combined with DTaP vaccines is incompatibility with the alum adjuvant. Experiments in the rat model with Hib alone have reported 5- to 11-fold lower levels of anti-PRP antibodies when adsorbed to aluminum hydroxide adjuvant. Taken together, the reduced Hib response in DTaP/Hib combinations is at least in part a result of the interaction of Hib with TT, FHA, and aluminum hydroxide adjuvant. The ACIP recommends that combination vaccines be used whenever possible. As new vaccines that target previously unaddressed diseases are added to the vaccination calendar, the use and improvement of currently available combination vaccines will be paramount if high vaccine coverage is to be maintained. In the final section below we will discuss future developments in this area, speculating on the possibility of addition of more vaccines to DTaP-based combinations as well as improvements to current combinations by increasing the compatibility of antigens, the addition of more potent adjuvants, or development of new methods for monitoring vaccine production. Although described as hexavalent on the basis of the number of diseases the vaccine targets, the currently available vaccine in this class, Infanrix TM -hexa, carries nine antigens plus inactivated polio virus. Other vaccines which protect solely against pneumococcal infections carry more antigens: for example, the 23-valent pneumococcal polysaccharide vaccine Pneumovax 23™; the updated conjugate vaccine Prevenar™ will contain 13 valences. It is likely that new combination vaccines will reach the market in the coming years, targeting additional diseases such as pneumococcal or meningococcal infections. Although there is no clinical data for DTaP-based combinations containing pneumococcal or meningococcal vaccine, there is considerable experience with the co-administeration of these vaccines. As seen with DTaP vaccines, increased local reactions are also observed with pneumococcal polysaccharide vaccines, which may pose another hurdle to combining these vaccines. A couple of studies with seven-valent pneumococcal conjugate vaccine co-administered with hexavalent DTaP-HepB-Hib/IPV reported increased incidence of systemic reactions, specifically fever, compared to administration of the two vaccines separately., Encouragingly, a review of the data available on this topic by Tozzi and coworkers  identified no negative effects of particular note in the few published studies that have examined the co-administration of pneumococcal or meningococcal conjugate vaccines with hexavalent DTaP-HepB-Hib/IPV. Singh and coworkers  explored the use of alternative adjuvant formulations, including the oil-in-water emulsion MF59 and polylactide co-glycolide (PLG) microparticles, with established vaccine antigens such as DT, TT, HepB (HBsAg), N meningitides serotype C conjugate (MenC), and a N meningitides serotype B recombinant antigen (MenB). MF59 emulsion stood out as a good alternative to alum for TT, HBsAg, MenC, and MenB vaccines, with the indication that it may be possible to replace alum with MF59 and improve immune responses to these antigens. PLG microparticles also showed promise, with responses comparable to or better than alum with both MenC and MenB vaccines. Disease prevention and eradication are the ultimate and immediate goals of immunization, and central to reaching these goals is achieving vaccine coverage. Combination vaccines can help overcome some of the key challenges to maintaining coverage through simplification of vaccine schedules and reduction of injections required. However, there are multiple technical challenges in maintaining immunogenicity and safety when combining vaccines. Continuing vaccine development will only increase the need for the use of combination vaccines, and the future development of larger combinations appears inevitable. 1. Edwards KM, Decker MD. Pertussis vaccine. In: Plotkin SA, Orenstein WA, Offitt P, editors. Vaccines. 5 th ed. USA: Saunders, PA; 2008. p. 471-528. 2. Centers for Disease Control and Prevention - United States. Recommended Immunization Schedule for Persons Aged 0 Through 6 Years. 2010. 3. Marshall GS, Happe LE, Lunacsek OE, Szymanski MD, Woods CR, Zahn M, et al. Use of combination vaccines is associated with improved coverage rates. Pediatr Infect Dis J 2007;26:496-500. 4. Kalies H, Grote V, Verstraeten T, Hessel L, Schmitt HJ, von Kries R. The use of combination vaccines has improved timeliness of vaccination in children. Pediatr Infect Dis J 2006;25:507-12. 5. Weston WM, Klein NP. Kinrix: A new combination DTaPIPV vaccine for children aged 46 years. Expert Rev Vaccines 2008;7:1309-20. 6. Zepp F, Schmitt HJ, Cleerbout J, Verstraeten T, Schuerman L, Jacquet JM. Review of 8 years of experience with Infanrix hexa (DTPaHBVIPV/Hib hexavalent vaccine). Expert Rev Vaccines 2009;8:663-78. 7. Bogaerts H. The future of childhood immunizations: Examining the European experience. Am J Manag Care 2003;9:S30-6. 8. White C, Halperin SA, Scheifele DW. Pediatric combined formulation DTaPIPV/Hib vaccine. Expert Rev Vaccines 2009;8:831-40. 9. Schmitt HJ. Immunogenicity and reactogenicity of two Haemophilus influenzae type b tetanus conjugate vaccines administered by reconstituting with diphtheria-tetanus-acellular pertussis vaccine or given as separate injections. In 35 th Interscience Conference on Antimicrobial Agents and Chemotherapy (ICAAC). San Francisco, CA, USA; 1995. 10. Eskola J, Ward J, Dagan R, Goldblatt D, Zepp F, Siegrist CA. Combined vaccination of Haemophilus influenzae type b conjugate and diphtheria-tetanus-pertussis containing acellular pertussis. Lancet 1999;354:2063-8. 11. Slack MH, Schapira D, Thwaites RJ, Burrage M, Southern J, Andrews N, et al. Immune response of premature infants to meningococcal serogroup C and combined diphtheria-tetanus toxoids-acellular pertussis-Haemophilus influenzae type b conjugate vaccines. J Infect Dis 2001;184:1617-20. 12. Schmitt HJ, Knuf M, Ortiz E, Sänger R, Uwamwezi MC, Kaufhold A. Primary vaccination of infants with diphtheria-tetanus-acellular pertussis-hepatitis B virus-inactivated polio virus and Haemophilus influenzae type b vaccines given as either separate or mixed injections. J Pediatr 2000;137:304-12. 13. Decker MD. Principles of pediatric combination vaccines and practical issues related to use in clinical practice. Pediatr Infect Dis J 2001;20:S10-8. 14. Dagan R, Poolman JT, Zepp F. Combination vaccines containing DTPa-Hib: Impact of IPV and coadministration of CRM197 conjugates. Expert Rev Vaccines 2008;7:97-115. 15. Decker MD, Edwards KM, Bogaerts HH. Combination vaccines. In: Plotkin SA, Orenstein WA, Offit PA, editors. Vaccines. 5 th ed. USA: Saunders, PA; 2008. p. 1069-101. 16. Mawas F, Dickinson R, Douglas-Bardsley A, Xing DK, Sesardic D, Corbel MJ. Immune interaction between components of acellular pertussis-diphtheria-tetanus (DTaP) vaccine and Haemophilus influenzae b (Hib) conjugate vaccine in a rat model. Vaccine 2006;24:3505-12. 17. Schutze MP, Deriaud E, Przewlocki G, LeClerc C. Carrier-induced epitopic suppression is initiated through clonal dominance. J Immunol 1989;142:2635-40. 18. McGuirk P, Johnson PA, Ryan EJ, Mills KH. Filamentous hemagglutinin and pertussis toxin from Bordetella pertussis modulate immune responses to unrelated antigens. J Infect Dis 2000;182:1286-8. 19. Ramsay ME, McVernon J, Andrews NJ, Heath PT, Slack MP. Estimating Haemophilus influenzae type b vaccine effectiveness in England and Wales by use of the screening method. J Infect Dis 2003;188:481-5. 20. Fitzgerald M, Canny M, O′Flanagan D. Vaccination catch-up campaign in response to recent increase in Hib infection in Ireland. Euro Surveill 2005;10:E050929.2. 21. Steinhoff M, Goldblatt D. Conjugate HIB vaccines. Lancet 2003;361:360-1. 22. Bettinger JA, Halperin SA, De Serres G, Scheifele DW, Tam T. The effect of changing from whole-cell to acellular pertussis vaccine on the epidemiology of hospitalized children with pertussis in Canada. Pediatr Infect Dis J 2007;26:31-5. 23. Mast E, Mahony F, Kane M, Margolis H. Hepatitis B vaccine. In: Plotkin SA, Orenstein WA, Offit PA, editors. Vaccines. 5 th ed. USA: Saunders, PA; 2008. p. 205-241. 24. Greenberg DP, Wong VK, Partridge S, Chang SJ, Jing J, Howe BJ, et al. Immunogenicity of a Haemophilus influenzae type b-tetanus toxoid conjugate vaccine when mixed with a diphtheria-tetanus-acellular pertussis-hepatitis B combination vaccine. Pediatr Infect Dis J 2000;19:1135-40. 25. Greenberg DP, Wong VK, Partridge S, Howe BJ, Ward JI. Safety and immunogenicity of a combination diphtheria-tetanus toxoids-acellular pertussis-hepatitis B vaccine administered at two, four and six months of age compared with monovalent hepatitis B vaccine administered at birth, one month and six months of age. Pediatr Infect Dis J 2002;21:769-77. 26. Pichichero ME, Blatter MM, Reisinger KS, Harrison CJ, Johnson CE, Steinhoff MC, et al. Impact of a birth dose of hepatitis B vaccine on the reactogenicity and immunogenicity of diphtheria-tetanus-acellular pertussis-hepatitis B-inactivated poliovirus-Haemophilus influenzae type b combination vaccination. Pediatr Infect Dis J 2002;21:854-9. 27. European Agency for the Evaluation of Medicinal Products (EMEA). European Medicines Agency recommends suspension of Hexavac. 2005. Available from: http://www.emea.europa.eu/humandocs/PDFs/EPAR/Hexavac/29736905en.pdf [last accessed on 2010 Jan]. 28. Zanetti AR, Mariano A, Romanò L, D′Amelio R, Chironna M, Coppola RC, et al. Long-term immunogenicity of hepatitis B vaccination and policy for booster: An Italian multicentre study. Lancet 2005;366:1379-84. 29. Da Villa G, Romanò L, Sepe A, Iorio R, Paribello N, Zappa A, et al. Impact of hepatitis B vaccination in a highly endemic area of south Italy and long-term duration of anti-HBs antibody in two cohorts of vaccinated individuals. Vaccine 2007;25:3133-6. 30. Centers for Disease Control and Prevention - CDC. Pertussis vaccination: Acellular pertussis vaccine for reinforcing and booster use - supplementary ACIP statement. Recommendations of the Immunization Practices Advisory Committee (ACIP). 1992. Morbidity Mortality Weekly Report (MMWR) Recomm. Rep. 41(RR-1), 1-10. 31. Cohen R, Schuerman L. Reactogenicity of a new DTPa-HBV-IPV (+ and /Hib) vaccines after primary and booster doses. Presented at: 18 th Annual Meeting of the European Society for Pediatric Infectious Diseases (ESPID). Noordwijk, The Netherlands, 2000. 32. Braun MM, Mootrey GT, Salive ME, Chen RT, Ellenberg SS. Infant immunization with acellular pertussis vaccines in the United States: Assessment of the first two years′ data from the Vaccine Adverse Event Reporting System (VAERS). Pediatrics 2000;106:E51. 33. Deloria MA, Blackwelder WC, Decker MD, Englund JA, Steinhoff MC, Pichichero ME, et al. Association of reactions after consecutive acellular or whole-cell pertussis vaccine immunizations. Pediatrics 1995;96:592. 34. Rennels MB, Deloria MA, Pichichero ME, Losonsky GA, Englund JA, Meade BD, et al. Extensive swelling after booster doses of acellular pertussis-tetanus-diphtheria vaccines. Pediatrics 2000;105:e12. 35. Schmitt HJ, Beutel K, Schuind A, Knuf M, Wagner S, Müschenborn S, et al. Reactogenicity and immunogenicity of a booster dose of a combined diphtheria, tetanus, and tricomponent acellular pertussis vaccine at fourteen to twenty-eight months of age. J Pediatr 1997;130:616-23. 36. Scheifele DW, Halperin SA, Ferguson AC. Assessment of injection site reactions to an acellular pertussis-based combination vaccine, including novel use of skin tests with vaccine antigens. Vaccine 2001;19:4720-6. 37. Rennels MB. Extensive swelling reactions occurring after booster doses of diphtheria-tetanus-acellular pertussis vaccines. Seminars in Pediatric Infectious Diseases 2003;14:196-8. 38. Rowe J, Yerkovich ST, Richmond P, Suriyaarachchi D, Fisher E, Feddema L, et al. Th2-associated local reactions to the acellular diphtheria-tetanus-pertussis vaccine in 4-to 6-year-old children. Infect Immun 2005;73:8130-5. 39. Southern J, Andrews N, Burrage M, Miller E. Immunogenicity and reactogenicity of combined acellular pertussis/tetanus/low dose diphtheria vaccines given as a booster to UK teenagers. Vaccine 2005;23:3829-35. 40. Tichmann-Schumann I, Soemantri P, Behre U, Disselhoff J, Mahler H, Maechler G, et al. Immunogenicity and reactogenicity of four doses of diphtheria-tetanus-three-component acellular pertussis-hepatitis B-inactivated polio virus-haemophilus influenzae type b vaccine coadministered with 7-valent pneumococcal conjugate Vaccine. Pediatr Infect Dis J 2005;24:70-7. 41. Use of diphtheria toxoid-tetanus toxoid-acellular pertussis vaccine as a five-dose series. Supplemental recommendations of the Advisory Committee on Immunization Practices (ACIP). MMWR Recomm Rep 2000;49:1-8. 42. Herz A, Black S, Shinefield H, Noriega F, Greenberg D. Safety of Combined DTaP-IPV + PRP-T (Pentacel™) administered at 2, 4, 6, and 15 to 18 months of age. Pediatric Academic Societies Annual Meeting. Washington, DC, USA. 2005 May 14-17. 43. Huang LM, Chang LY, Tang H, Bock HL, Lu CY, Huang FY, et al. Immunogenicity and reactogenicity of a reduced-antigen-content diphtheria-tetanus-acellular pertussis vaccine in healthy Taiwanese children and adolescents. J Adolesc Health 2005;37:517. 44. Kosuwon P, Warachit B, Hutagalung Y, Borkird T, Kosalaraksa P, Bock HL, et al. Reactogenicity and immunogenicity of reduced antigen content diphtheria-tetanus-acellular pertussis vaccine (dTpa) administered as a booster to 4-6 year-old children primed with four doses of whole-cell pertussis vaccine. Vaccine 2003;21:4194-200. 45. Sänger R, Behre U, Krause KH, Loch HP, Soemantri P, Herrmann D, et al. Booster vaccination and 1-year follow-up of 4-8-year-old children with a reduced-antigen-content dTpa-IPV vaccine. Eur J Pediatr 2007;166:1229-36. 46. NHS Routine childhood immunization programme January 2008. Available from: http://www.immunisation.nhs.uk/immunisation_schedule [last accessed on 2010 Jan]. 47. Robert Koch-Institut. Recommendation of the Standing Committee on Vaccination (STIKO) at the Robert Koch Institute for pertussis vaccination. Epidemiologisches Bulletin 2006;3:21-3. 48. Scheifele DW, Halperin SA, Smith B, Ochnio J, Meloff K, Duarte-Monteiro D. Assessment of the compatibility of co-administered 7-valent pneumococcal conjugate, DTaP. 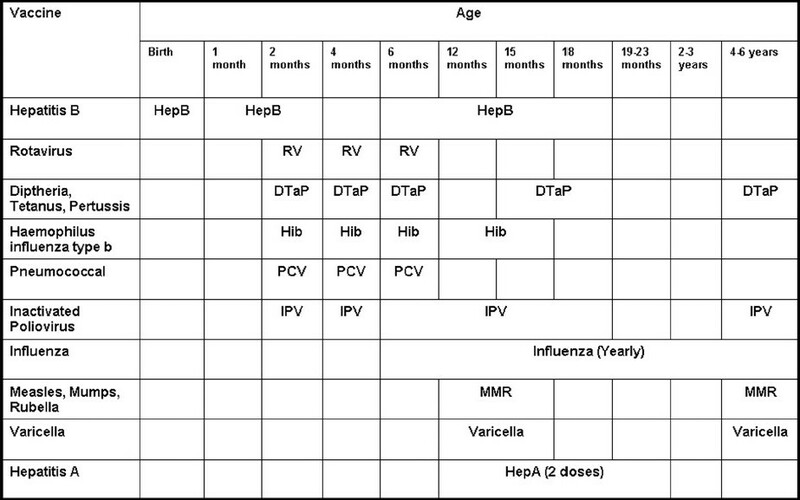 IPV/PRP-T Hib and hepatitis B vaccines in infants 2-7 months of age. Vaccine 2006;24:2057-64. 50. Prevention of pneumococcal disease: Recommendations of the Advisory Committee on Immunization Practices (ACIP). MMWR Recomm Rep 1997;46:1-24. 51. Knuf M, Habermehl P, Cimino C, Petersen G, Schmitt HJ. Immunogenicity, reactogenicity and safety of a 7-valent pneumococcal conjugate vaccine (PCV7) concurrently administered with a DTPa-HBV-IPV/Hib combination vaccine in healthy infants. Vaccine 2006;24:4727-36. 52. Tozzi AE, Azzari C, Bartolozzi G, Esposito S, Fara GM, Giudice ML. Can hexavalent vaccines be simultaneously administered with pneumococcal or meningococcal conjugate vaccines? Hum Vaccin 2007;3:252-9. 53. Tejedor JC, Omeñaca F, García-Sicilia J, Verdaguer J, Van Esso D, Esporrín C, et al. Immunogenicity and reactogenicity of a three-dose primary vaccination course with a combined diphtheria-tetanus-acellular pertussis-hepatitis B-inactivated polio-haemophilus influenzae type b vaccine coadministered with a meningococcal C conjugate vaccine. Pediatr Infect Dis J 2004;23:1109-15. 54. Schmitt HJ, Habermehl P, Knuf M, Ypma E, Borkowski A. Safety reactogenicity and mmunogenicity / priming following 2 vs. 3 doses of a meningococcal C conjugate vaccine (MCC) given concomitantly with DTaP-IPV-HBV/Hib vaccine to infants in 23 rd Annual Meeting of the European Society for Pediatric Infectious Diseases (ESPID). Valencia, Spain, 18-20 May 2005. 55. Schmitt HJ, Maechler G, Habermehl P, Knuf M, Saenger R, Begg N, et al. Immunogenicity, reactogenicity and immune memory after primary vaccination with a novel Haemophilus influenzae-Neisseria meningitidis serogroup C conjugate vaccine. Clin Vaccine Immunol 2007;14:426-34. 56. Tejedor JC, Moro M, Ruiz-Contreras J, Castro J, Gómez-Campderá JA, Navarro ML, et al. Immunogenicity and reactogenicity of primary immunization with a hexavalent diphtheria-tetanus-acellular pertussis-hepatitis B-inactivated polio-Haemophilus influenzae type B vaccine coadministered with two doses of a meningococcal C-tetanus toxoid conjugate vaccine. Pediatr Infect Dis J 2006;25:713-20. 57. Halperin SA, McDonald J, Samson L, Danzig L, Santos G, Izu A, et al. Simultaneous administration of meningococcal C conjugate vaccine and diphtheria-tetanus-acellular pertussis-inactivated poliovirus-Haemophilus influenzae type b conjugate vaccine in children: A randomized double-blind study. Clin Invest Med 2002;25:243-51. 58. Gasparini R, Conversano M, Bona G, Gabutti G, Anemona A, Dull P, et al. Immunogenicity and safety of MenACWY-CRM, A novel quadrivalent meningococcal conjugate vaccine, administered concomitantly with Tdap in healthy subjects 11-25 years of age. Presented at: 26 th Annual Meeting of the European Society for Paediatric Infectious Diseases. Graz, Austria, 2008. 59. Dagan R, Goldblatt D, Maleckar JR, Yaïch M, Eskola J. Reduction of antibody response to an 11-valent pneumococcal vaccine coadministered with a vaccine containing acellular pertussis components. Infect Immun 2004;72:5383-91. 60. Baraldo K, Mori E, Bartoloni A, Petracca R, Giannozzi A, Norelli F, et al. N19 polyepitope as a carrier for enhanced immunogenicity and protective efficacy of meningococcal conjugate vaccines. Infect Immun 2004;72:4884-7. 61. Baraldo K, Mori E, Bartoloni A, Norelli F, Grandi G, Rappuoli R, et al. Combined conjugate vaccines: Enhanced immunogenicity with the N19 polyepitope as a carrier protein. Infect Immun 2005;73:5835-41. 62. O′Hagan DT, De Gregorio E. The path to a successful vaccine adjuvant-′The long and winding road′. Drug Discov Today 2009;14:541-51. 63. Singh M, Ugozzoli M, Kazzaz J, Chesko J, Soenawan E, Mannucci D, et al. A preliminary evaluation of alternative adjuvants to alum using a range of established and new generation vaccine antigens. Vaccine 2006;24:1680-6. 64. Coombes L, Stickings P, Tierney R, Rigsby P, Sesardic D. Development and use of a novel in vitro assay for testing of diphtheria toxoid in combination vaccines. J Immunol Methods 2009;350:142-9. 65. Cuervo ML, Sterling AL, Nicot IA, Rodríguez MG, García OR. Validation of a new alternative for determining in vitro potency in vaccines containing Hepatitis B from two different manufacturers. Biologicals 2008;36:375-82. 66. Giffroy D, Mazy C, Duchêne M. Validation of a new ELISA method for in vitro potency assay of hepatitis B-containing vaccines. Pharmeuropa Bio 2006;2006:7-14. 67. Prieur S, Broc S, Gal M, Poirier B, Fuchs F. Development of an in vitro potency test for tetanus vaccines. In: Brown F, Hendriksen C, Sesardic D, Cussler K, editors. Advancing Science and Elimination of the Use of Laboratory Animals for Development and Control of Vaccines and Hormones. Basel: S. Karger AG Publiation; 2002. p. 37. 68. Xing DK, McLellan K, Corbel MJ, Sesardic D. Estimation of antigenic tetanus toxoid extracted from biodegradable microspheres. Biologicals 1996;24:57-65. 69. Bolgiano B, Fowler S, Turner K, Sesardic D, Xing DK, Crane DT, et al. Monitoring of diphtheria, pertussis and tetanus toxoid by circular dichroism, fluorescence spectroscopy and size-exclusion chromatography. In: Brown F, Corbel MJ, Griffiths E, editors. Physico-chemical Procedures for the Characterization of Vaccines, S. Karger AG, Basel: 2000. p. 51. 70. Leenaars PP, Kersten GF, de Bruijn ML, Hendriksen CF. An in vitro approach in quality control of toxoid vaccines. Vaccine 2001;19:2729-33. 71. Metz B, Jiskoot W, Hennink WE, Crommelin DJ, Kersten GF. Physicochemical and immunochemical techniques predict the quality of diphtheria toxoid vaccines. Vaccine 2003;22:156-67. 72. Metz B, Jiskoot W, Mekkes D, Kingma R, Hennink WE, Crommelin DJ, et al. Quality control of routine, experimental and real-time aged diphtheria toxoids by in vitro analytical techniques. Vaccine 2007;25:6863-71. 73. Zhu D, Huang S, Gebregeorgis E, McClellan H, Dai W, Miller L, et al. Development of a Direct Alhydrogel Formulation Immunoassay (DAFIA). J Immunol Methods 2009;344:73-8. Moyle, P.M. and Toth, I. 5 What can we learn from the microbial ecological interactions associated with polymicrobial diseases? 8 Perspectives on optimization of vaccination and immunization of ethiopian children/women: What should and can we further do? why and how?